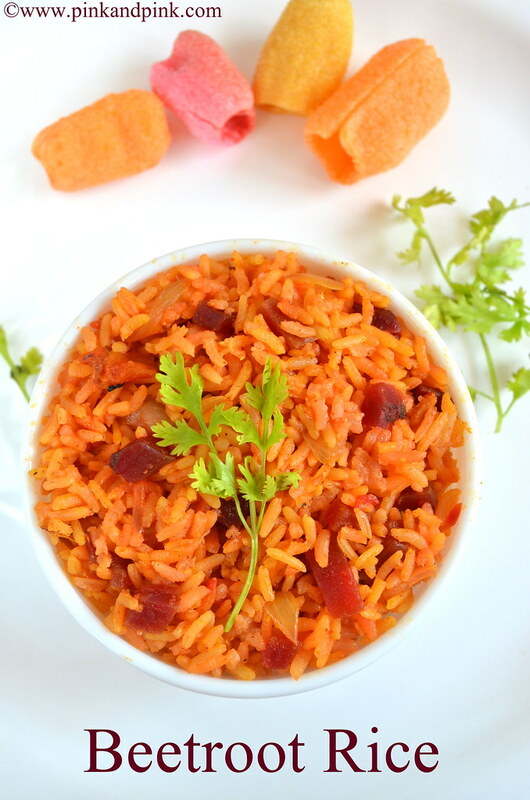 Beetroot rice recipe is a very simple and healthy variety rice recipe. It is a good time saver since we do not need to cook any vegetables or kulambu separately. You can pack it in lunchbox too. The list of ingredients is also not quite big. 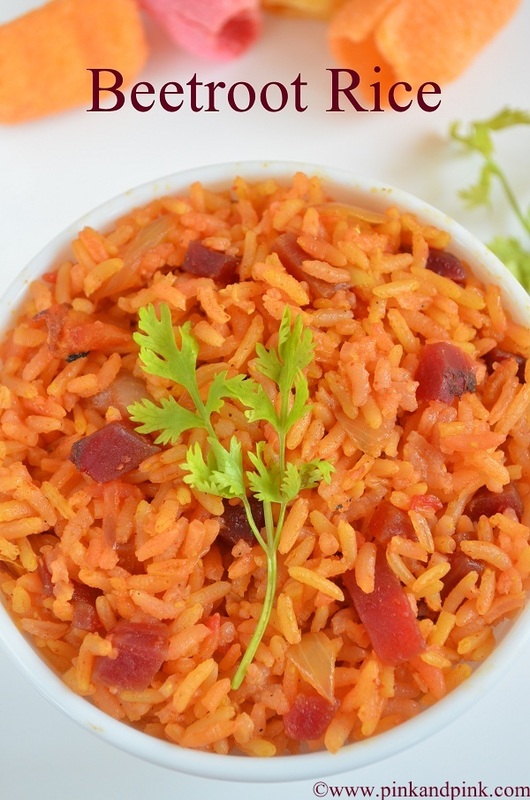 Do not add more ghee as it will spoil the real flavor of beetroot rice. Do not add more chilli powder or ginger garlic paste too for the same reason. My favorite side dish for beetroot rice is plain curd. Onion raitha, Boondi raitha, pappad and fryums also act as great accompaniments. 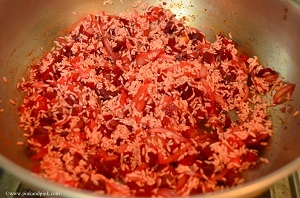 Now, let us see how to make beetroot rice/beetroot pulao. 1. 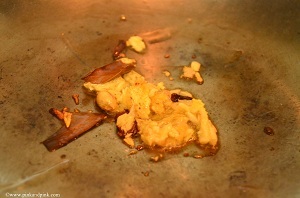 Heat oil in the pressure cooker or a pan. You can either do it directly in pressure cooker. Or you can do it in a pan and transfer it into a cooker. 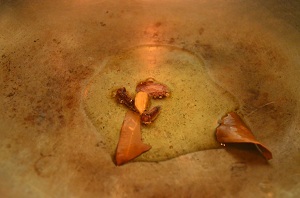 Saute cinnamon, cardamom and bay leaf till nice aroma comes. 2. 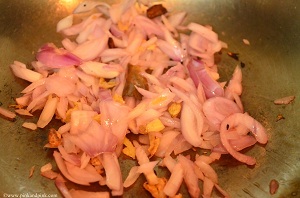 Add ginger garlic paste and saute till nice aroma comes. 4. 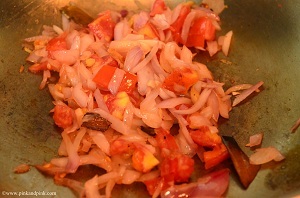 Add chopped tomatoes and saute till till they turn mushy. 5. 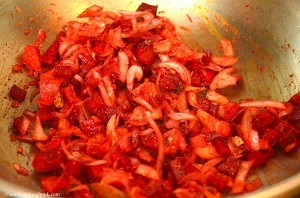 Add chopped beetroot, coriander powder, turmeric powder and red chilli powder. Saute for 2 minutes. 6. Add rice and saute for a minute. Add water and required salt. 7. Pressure cook the rice for 2-3 whistles(based on your cooker) in high flame and 5 minutes in simmer. 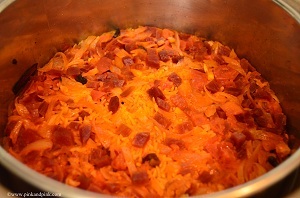 Once the rice is cooked and pressure gets released, sprinkle ghee and mix well with a fork. 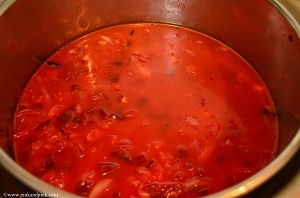 Do not mix too much since the beetroot rice will become mushy. 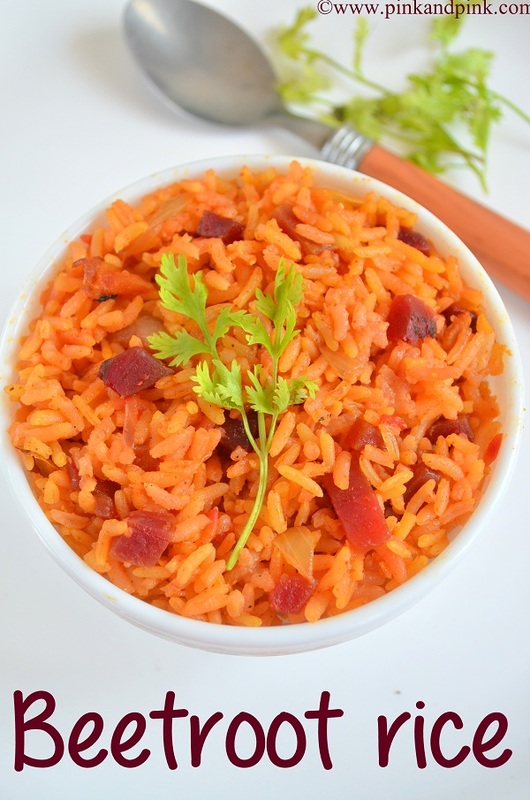 Now, tasty and healthy beetroot rice is ready. Hope you liked the Beetroot rice recipe.